Borough President Marty Markowitz sat down for a year-end interview with Brooklyn Papers’ editor Gersh Kuntzman, and while the newspaper’s excerpts capture the major issues--Markowitz's criticism of the Papers and his forceful defense of AY--the unedited audio linked from the article is worth a listen, both for some tidbits unavailable in print as well as a flavor of our feisty Borough President. While the discussion ranged over Brooklyn issues from health to the Parachute Jump, it regularly returned to Atlantic Yards, about which Markowitz was sometimes pensive and prideful but more frequently combative and strident. He dismissed opponents and critics by suggesting they should turn their attention to more important things, argued for greater density without defining limits, and flatly lied (or misspoke) about the traffic impacts of the project. One word that came up several times was “hateful,” and Markowitz used it to describe the Papers’ coverage as well as some of the comments and emails directed toward him. He didn't mention that project supporters might be contributing to polarization, too. I’ve been the recipient, more than anyone else on this project, I think maybe even more than Bruce Ratner, but certainly as far as any elected official going, a reciptient of more [inaudible] and hate, from those that feel that Atlantic Yards is more important than the issue of Osama Bin Laden and terrorism. There’s no question that there’s an element of people that truly believe that the greatest challenge facing America is the Atlantic Yards Project rather than terrorism and Osama Bin Laden and Al-Qaeda. Does he really believe that politically engaged people can’t keep local and national issues straight? Atlantic Yards is a local issue—probably the biggest local issue in Brooklyn—and Markowitz was elected to be Borough President. That’s why his office filed an extensive response to the AY Draft Environmental Impact Statement. Markowitz has no role in fighting terrorism and searching for Osama Bin Laden (unless he’s conducting reconnaissance missions in Junior’s). Still, it turns out, terrorism is an Atlantic Yards issue. Despite calls from community groups for the state review of Atlantic Yards to include post-9/11 security considerations, the state took a pass—and Markowitz said nothing. Listen to me, their arguments come down to the following: the heights of the building, the shadows they cast and the traffic issues. If you had to shake it down, that’s really what it all is. Kuntzman didn’t raise the additional point: the core of the pending eminent domain lawsuit is one about democracy. Was there a planning process? Is this the right way to develop on publicly-owned land? What’s the role of the public here? But, yes, it may take a minute or two minutes longer to transverse Atlantic Avenue..so my question is: what is the balance between the public good and our own private little tunnel? I say, listen, I’m on Atlantic Avenue as much as anybody, I think it’s going to take me, on game nights, if it’s going to take me a minute or two longer, to go up Flatbush Avenue, or go across Atlantic Avenue. And I’m convinced that there will be enormous steps taken to mitigate the traffic issues. It’s important for the city and the developer for this project to work… We’re all pulling together to mitigate the traffic on game nights. You know, in the mornings, it’s not going to impact at all. During rush hours, if you’re driving, perhaps right before the games, perhaps there will be additional traffic issues. Actually, Chapter 12 of the Final Environmental Impact Statement (p. 3) identifies 46 intersections (of 93 analyzed) that would have “significant adverse impacts” in the weekday morning peak hours by project completion in 2016; even after the recommended mitigation measures, 11 intersections with significant impacts would remain. And that’s from the Empire State Development Corporation; transportation analysts Brian Ketcham and Carolyn Konheim have blasted the state analysis. Markowitz said that the site is certainly a prime area to be able to build housing of greater density… because it works here, because not everybody lives in a brownstone. Not everybody lives in a brownstone! There is large housing--there is a public housing in that neighborhood, high rise housing in that area. Indeed, that’s been Forest City Ratner’s argument. Where do we take our cues? The 12- and 15-story subsidized buildings across Atlantic Avenue? The 512-foot Williamsburgh Savings Bank? The row houses that are being replaced? The single tall public housing tower across Atlantic? (Remember, each Atlantic Yards building would be more dense than that 31-story tower.) Shouldn’t the density issue be derived through some sort of planning process? They’ve accelerated the renaissance of Brooklyn, by the very fact of their being here and investing in their community and growing their families, I don’t feel any hatred for them. But what they don’t see, in my opinion, is what I see, the transition of Brooklyn not being a backwater to Manhattan. “We’re not a backwater, we’re not. We’re not only single family homes, we’re not. But the debate isn’t over row houses versus towers; it is what would be appropriately dense development at the site. 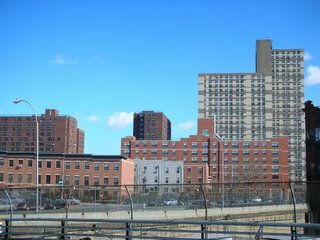 As a former tenant advocate, Markowitz knows the difference between “low-income” and “very low income;” one criticism of the Atlantic Yards project from some housing groups is that very low-income households, with the incomes of some who currently occupy rent-controlled apartments in the footprint, would not be part of the project. The benefits — the creation of eight acres of open green space, parks, which will provide a tapestry that will knit together Prospect Heights and Fort Greene, as opposed to a moat that we’ve had for 100 years — overwhelm those who say the buildings are too high. Kuntzman didn’t point it out, but the space would not be a park, since it would be privately-managed, and critics believe that it would serve more as backyards of enormous buildings rather than a tapestry. The public subsidies are appropriate. Every project in this city, the government does provide infrastructure. That’s a given. [The Atlantic Yards subsidy] goes above that to assist the affordable housing component. If we didn’t have the affordable housing, this wouldn’t be necessary. Special Benefits for the Atlantic Yards Project. Under the MOU, Atlantic Yards would receive several special benefits not available as-of-right to development projects: capital contributions from the city and state, low-cost financing for the arena, extra property tax savings, a low-cost lease, and property obtained using the state’s power of eminent domain. It’s all part of a vibrant, exciting downtown, which is what this is. The opponents even argue that Atlantic [Avenue] isn’t Downtown. I don’t know what they think is Downtown. DeKalb Avenue? What’s Downtown? Downtown is definitely Atlantic Avenue going north. It’s Downtown. There’s no question about it. I think they think the corner of Junior’s and the Manhattan Bridge is Downtown. Except Atlantic Avenue is the northern border of the project. It’s safe to say that the western edge of the project borders or is part of Downtown Brooklyn, but most of the site would be in Prospect Heights. Markowitz has a point that a property owner has a right to protect his buildings, but is the number of cameras typical or excessive? That’s worth some context. We’re taking a space that was blighted, no question! Blighted, deteriorated, ugly, in terms of Atlantic Yards itself. And some of the buildings that abut Atlantic Yards that have been vacant for years. Well, it’s a little more complicated, as Develop Don’t Destroy Brooklyn would argue. Instead of prices going down, they’re going up. People are buying right around it, knowing! Anyone that bought, in the last year or two, certainly knows that an arena is going to built in this project…. They’re buying because this project is going to be a benefit…. You have to understand that land is at a premium. Indeed, if buyers thought that Atlantic Yards would be a detriment, they’d be slower to buy. But that perhaps depends on how close people would be. How well is the conversion of the Williamsburgh Savings Bank into One Hanson going? I’m delighted by the way, that my idea about reducing the height of Miss Brooklyn... It was something I suggested, publicly and privately. It’s a celebration of the Williamsburgh building. I don’t know what the days will bring to Downtown Brooklyn… but for the immediate future it appears the Williamsburgh building will remain the tallest building, it’s really a representation to me of the past, the best of the past. Kuntzman didn’t point out that the developer reneged on a longstanding promise not to block the view corridor of the bank. I’m able to share characters, character, and the development of Brooklyn in… a feature paper, sharing the story of Brooklyn together. Still, it's notable that the topic which took up most of his year-end interview, Atlantic Yards, barely appears in Brooklyn! !, if at all. When the term-limited Borough President was asked for what office he was busy fund-raising, Markowitz got quiet and, at least publicly, seemed noncommittal: “I don’t know. I’d like to stay in public service,” he said, indicating it was still under advisement. Many believe he’ll run for Mayor in 2009. The only ones that I dismiss are the ones that call me schmuck, garbage, traitor. Then Markowitz and Kuntzman get into a discussion about whether rent-stabilized tenants in the footprint are adequately protected. Markowitz says they’ll get a place in the new development. “If it’s built,” responds Kuntzman. The discussion trails off, but Markowitz seems to be saying that the tenants should trust Ratner. The legal agreements, at last report, still leave the developer an out.